The king of clumpers, the tallest and most upright of the Fargesia genus. 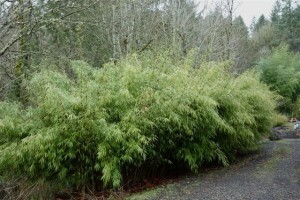 One of the more sun tolerant clumping bamboo, in the Portland area it can be in full sun, but it might be shorter and sometimes stressed in the summer. It is an early shooter, giving it a head start on the growing season resulting in vigorous, reliable and resilient growth. White culm sheathes form a contrasting pattern with the green new shoots. Makes a great screen or background anchor. Looks good in corners where it has room to grow. More photos and description from Bamboo Garden. The queen of the clumpers, tall and upright, colorful and dynamic on close close inspection. Fairly sun tolerant, but like most Fargesia prefers afternoon shade. Early shoots are covered in rusty orange culm sheathes which fade with age. New shoots can have variations of powdery steel blue and purple highlights which contrast with the orange culm and branch sheathes. The cane colors are fleeting and not obvious from afar, but striking up close. It makes a good screen, but is slightly more open than “Campbell”. More photos and description from Bamboo Garden. One of the toughest and fastest growing clumping bamboo. It is very tolerant of adverse conditions, cold, wind, sun and drought barely phase Rufa. It is an attractive evergreen with a dense bushy habit. Orange culm and branch sheathes adorn the the plant during its early shooting season. Makes an excellent shorter hedge, especially along fences where its short stature will not cast much shade. More photos and description from Bamboo Garden. One of the most graceful and dynamic clumping bamboo. This specie can tolerate a wide variety of conditions, very tough and hardy, it can stand hot sun, but the leaves curl more than most and is not as attractive. It does like some sun though, especially early or low angled light which will turn the canes a deep burgundy. It has the smallest leaves of the Fargesias’ giving it a willowy, dainty and flowing look. During the fall about 1/4 of its leaves turn a uniform yellow then fall off adding more contrast to the plant. It does not become bare, if you only saw before and after leaf drop it would be hard to tell anything happened. It is one of the more upright bamboos as well, the canes grow closely together and the small leaves bear little weight on the slender canes. It looks good almost anywhere, though planted in an open area where the canes can be appreciated is especially nice. The small leaves provide good contrast with other larger leaved plants placed nearby. One of our favorite bamboos. More photos and description from Bamboo Garden. 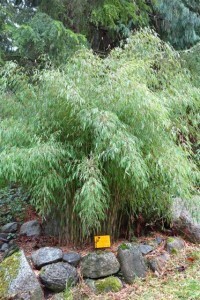 A unique bamboo due to its almost furry looking arching canes. Denudata has a dense branching pattern with small leaves that radiate out from the canes causing the culms to droop and sway. It can have a tiered look as the new shoots rise above the older foliage, but remain relatively bare of leaves until the following growing season. Because it is so droopy it is best placed with lots of space, not a good plant for a narrow walkway. It can make a nice screen or interesting focal point in a corner or at a distance. It is moderately sun tolerant, but cold hardy. More photos and description from Bamboo Garden.